A red wine produced from the pinot noir grape (vitis vinifera), the wine is derived from the French words for “pine” and “black”, referring to the pine cone shaped clusters and the dark coloring of the grape bunches. Grown around the world, though mostly in cooler regions, Pinot Noir is quickly becoming one of the most popular wine varietals available. Thriving in the Burgundy region of France, Pinot Noir is now grown throughout Europe, Australia, New Zealand, South Africa, and the United States. The leaves of the Pinot Noir plant are smaller than those of the Cabernet Sauvignon, but larger than those of the Syrah. 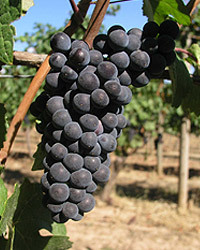 Pinot Noir grown for dry table wine (as opposed to that grown for Champagne), is usually low-yielding and difficult to grow, adding to the distinction of the grape. Pinot Noir is an ancient varietal of grape, perhaps only 1 or 2 generations removed from being a wild grape. Believed to have first been seen in the 1st century A.D in the Burgundy region, there are also references to the grape growing in Belgium during the same time. Prone to mutation, there are currently over 50 variations of pinot noir recognized by France, as opposed to only 25 of the more widely planted cabernet sauvignon. Pinot Gris is arguably the most well known derivative of pinot noir. While grown throughout the world, pinot noir is best known for being grown in the Burgundy region of France and in the western United States. California produces the most pinot noir in the US, particularly the Sonoma Valley area, with Oregon coming in a close second. Washington and New York also produce pinot noir, though not in the same volumes. While pinot noir has always enjoyed a certain level of popularity, the recent rise in popularity can certainly be tied to the release of the movie Sideways, featuring Paul Giamatti as Miles Raymond, a writer and wine lover who favors pinot noir over all grapes due to the difficulty in growing it. Shortly after the release of the movie, many retailers and restaurants had a difficult time keeping pinot noir in stock due to the sharp increase in demand across the country. While the range of varieties of pinot noir means there are numerous flavors and aromas associated with pinot noir, generally the wine is medium bodied with aromas reminiscent of black cherry, raspberry, or currant. The color is usually referred to as garnet, and tends to be lighter than other red wines. Traditionally having an earthy flavor, a new trend from New Zealand and California is to produce a more fruit forward pinot noir.